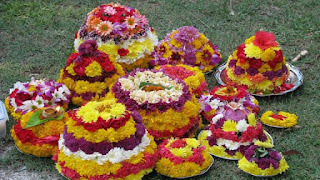 Batukamma is a Telangana Floral Festival and is the symbol of Telangana culture. Batukamma ( బతుకమ్మ) is the form of Goddess Gowri. Batukamma festival is a nine day long festival and begins on the Aswayuja Amavasya day. It ends on the Ashtami day in the same month. Batukamma or the Gowri Devi is created with many varieties of flowers in a brass plate and on the tenth day of the festival, these are immersed in water bodies. This festival is usually celebrated in the months of September or October every year. Batukamma festival is not only a tradition but has scientific reasons also. The flowers used in the arrangement of Batukamma are seasonal flowers and have medicinal values. Common flowers used in the arrangement are ‘Tangedu(తంగెడు), Gunuka(గునుగు), Banti, Chemanti(చామంతి), Nandi Vardhanam etc. The Gunuka flower has anti diarrhea and anti diabetic properties. Banti or Marigold is believed to have the capacity to prevent mosquitoes. Chemanti or Chrysnthemum is used as medicine for burns, injuries, eye related diseases and also for digestion problems. It also has anti bacterial properties. History of Batukamma: There are many ancient stories that tell us the reasons why the festival is celebrated. One of such story is like this. A girl commits suicide unable to bear the bad deeds of the local landlord. The people in the village blessed her as ‘Batukamma’ which means ‘long live’. Women pray to Goddess Gowri to give her blessings to their husbands and families. Another legend about Batukamma festival is like this. Dharmangada is the ruler of south India. He was childless and so he prays to Gods and performs many rituals and Pujas. His wife becomes pregnant and gives birth to a baby girl. The girl is named Lakshmi. She was also given the name ‘Batukamma’ as she survived many accidents. She prays to Goddess Gowri to give him a good husband and this tradition continued. Batukamma festival is celebrated very grandly across the Telangana state by young girls and married women. Married women pray for the welfare of their husbands and families. Young girls pray the Goddess to bless them with good husbands. Men also have a role to play in the festival as they collect all varieties of flowers to be used in the arrangements of Batukamma. Batukamma is basically a festival to worship the nature. The flowers, the earth and the water are made parts of the celebration of the festival.